The police today called on the remaining escapees to surrender. 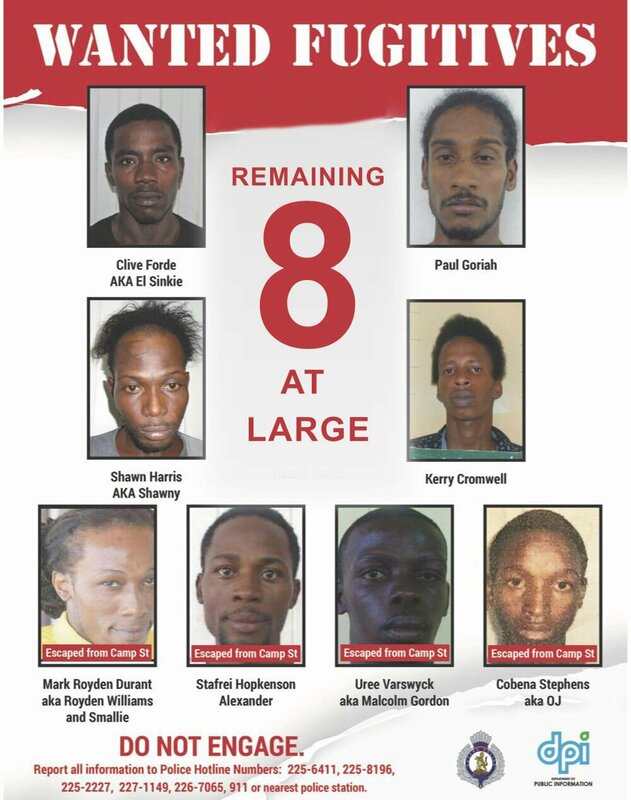 Clive Forde C/D El Sinkie, Paul Goriah, Shawn Harris C/D Shawny, Kerry Cromwell, Mark Royden Durant C/D Royden Williams and Smallie, Stafrie Alexander Hopkinson, Uree Varswyck C/D Malcolm Gordon and Cobena Stephens C/D OJ are wanted by the police for Escaping from Lawful Custody (Georgetown and Lusignan Prisons). The Guyana Police Force in its efforts to recapture the inmates, is appealing to members of the public, relatives and friends to give any relevant information as to the whereabouts of these escapees so that they can be captured and returned to the prison. Also an appeal is being made to the escapees to surrender to the police or relevant authority, to avoid any serious confrontation that is likely to result in the use of force. All information will be treated with a high degree of confidence and also the rights of those escapees will be respected and upheld. Anyone with information that may lead to the arrest of Clive Forde C/D El Sinkie, Paul Goriah, Shawn Harris C/D Shawny, Kerry Cromwell, Mark Royden Durant C/D Royden Williams and Smallie, Stafrie Alexander Hopkinson, Uree Varswyck C/D Malcolm Gordon and Cobena Stephens C/D OJ is asked to contact the police on telephone numbers 225-6411, 225-8196, 225-2227, 227-1149, 226-7065, 911 or the nearest police station.